9 Star Ki is oriental in origin and based on the I Ching , and ancient book of devination. It is one of the oldest forms of astrology in the world, originally used in Ancient China. 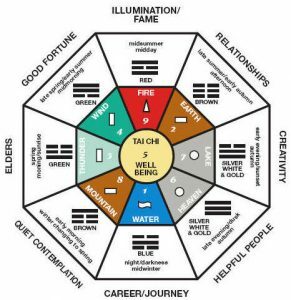 It is particularly useful alongside Spatial Feng Shui as the 9 energies are the same as those used in the Bagua, which is the template, placed over the plans of your property to establish the positions of the 9 life areas in your home or business. 9 Star Ki Astrology is based on the concept that 9 key stars had the most influence on human chi and that each direction, combined with the chi of Earth and the Heavens at the time of birth create a different energy (chi) for each person. To promote a better understanding of who you are and to understand your interaction with other members of your family. To understand the behaviour of others, e.g. friends and family, members of staff, and other key personnel. To establish which are the best directions to face for sleeping and working. To avoid moving in “ unfavourable directions”. The third number provides insight into your outer (expressive) nature and relates to the first impression you give i.e. how people see you. I will use 9 Star Ki Astrology in a Feng Shui consultation to assess the interactions with all the people in the house or will determine the 9 Star Ki of the key personnel in a business. Best directions for working and sleeping will also be established.